Posted by Jace Stolfo on Friday, March 16th, 2012 at 7:27am. There were 3,579 home sales in Boise during 2011. Of these, 1,713 were Boise Idaho foreclosures consisting of 605 short sales, 1003 bank-owned (REO) properties and 105 HUD properties. 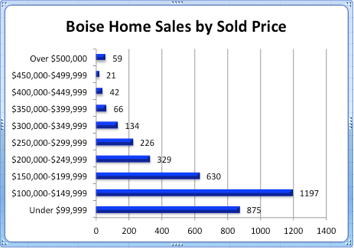 The largest majority of homes sold in Boise, 2,702 or 75% of all home sales for 2011, sold for less than $250,000. Of the 875 homes under $100,000 that were sold, 83% were foreclosures (short sales, bank owned and HUD properties); whereas only 53% of the homes between $100,000 and $150,000 were foreclosures. 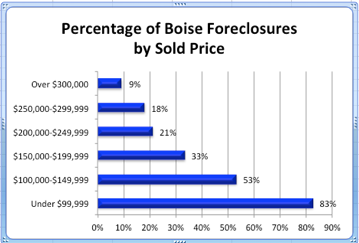 As you can see from the graph, the higher the price the lower the percentage of foreclosures in Boise Idaho. In fact, for properties over $300,000, only 9% were foreclosures. Many people find it surprising that the vast majority of Boise Idaho foreclosures sell near the asking price. 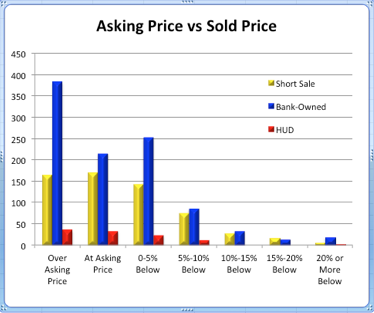 In fact, an average of 59% sell at or above the asking price. Of the remaining properties, the majority, almost 25%, sell for 0-5% below asking price. The reason they sell so close to the asking price is because they are typically priced very competitively. In fact, these properties are usually in such demand that many receive multiple offers within the first few days of being on the market. If you're considering buying a foreclosure, make sure you sign up for our foreclosure alerts.